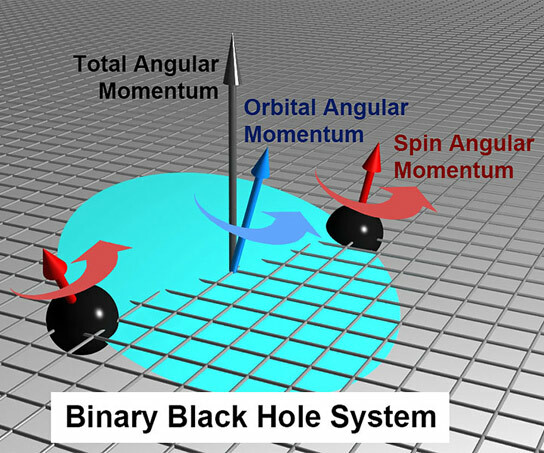 In a binary black hole system, the directions of the spin angular momentum of each black hole (red cone arrows) and of the orbital angular momentum for the system (blue cone arrow) change, or precess, over time. In a new study, astrophysicists provide for the first time solutions to decades-old equations that describe conditions as two black holes in a binary system orbit each other and spiral in toward a collision. New research by Dr. Michael Kesden, assistant professor of physics at UT Dallas, and his colleagues provides revelations about the most energetic event in the universe — the merging of two spinning, orbiting black holes into a much larger black hole. The work provides for the first time solutions to decades-old equations that describe conditions as two black holes in a binary system orbit each other and spiral in toward a collision. The research is published in the journal Physical Review Letters. Be the first to comment on "First Time Solutions Provide New Insight in Black Hole Collisions"